So much of Kryzstzstof Kieslowski’s work flies in the face of Hollywood convention, whether in its themes, visual execution or character development. So it is odd that the middle film of the Three Colours trilogy should fall into the same trap as the middle instalments of Hollywood trilogies. Just as Back to the Future Part II and Indiana Jones and the Temple of Doom are overshadowed by their surrounding counterparts, so Three Colours – White drops the ball by quite a long way. There are interesting elements throughout, but the result is ultimately disappointing. White is probably the most personal of Kieslowski’s trilogy, since it deals not only with French society but with his Polish homeland. Much of the film is concerned with the state of the Polish economy as our protagonist travels home to find his brother and take up a proposition by a strange man called Mikolaj. Kieslowski has a decent stab at showing how Polish society has changed since the end of the Cold War, mainly through little touches in the dialogue; for example, when the criminals mug Karol, they find his watch is made in Russia and quickly throw it away. In its examination of capitalism and family, White could be described as a heavy-hearted eulogy to Poland, since the comedy is clearly affectionate but is solidly rooted in pathos. Although Kieslowski’s early work ran into trouble with the communist authorities, he does not see its replacement as an unequivocal improvement. Certainly the presence of wealth and the free market doesn’t seem to make life easier for Karol, who resembles Chaplin’s little tramp in his combination of initiative and stupidity. Aside from its elegiac feel, White is as visually stylish as Blue and Red. Edward Klosinski’s cinematography alternates between the sparse snowy landscapes of rural Poland and the pearly-white columns of the Parisian law courts. White is seen as a symbol of simplicity, purity and impartiality, all of which converge in the film’s central theme of equality. Here, however, is the first problem with the film. Whereas Blue was absolutely clear in its examination of liberty, seeing it as something emotional rather than political, White somehow confuses the two and wrongfully intertwines them. Karol’s motivation throughout the film is to win back his ex-wife, which is fair enough. But he chooses to achieve this by amassing material wealth and then faking his own death to draw her out in sympathy. There seems to be an assumption within the film that gaining economic or financial equality with someone will somehow make them re-evaluate you romantically; a cynical notion, to be sure, but one which jars with the optimistic tone of the central performance. The theme of equality is communicated in a variety of ways over the course of the film. 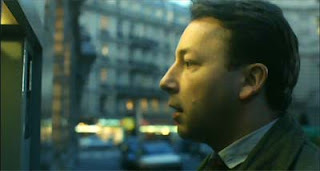 During the court scene, Karol accuses the judge of not giving him a fair hearing simply because he cannot speak much French. Kieslowski pulls a clever trick here by only subtitling the sections of dialogue which are in French, so that we instantly understand Karol’s feeling of being shut out and unrepresented. The result of the divorce hearing, in which his cold-hearted wife gains everything, also reflects the way in which the system is skewed. This example is later taken to the extreme when his ex-wife torches her place of work and tells him that the police will believe he did it. White attempts to be an anti-comedy, but it is stymied by its continued falling into comedy conventions. Although it is full of pathos and is therefore not laugh-out-loud funny, it is still ultimately comedic in the same way that The Kid or Modern Times are comedic; they are populated with characters whose predicaments we share and with whom we sympathise. 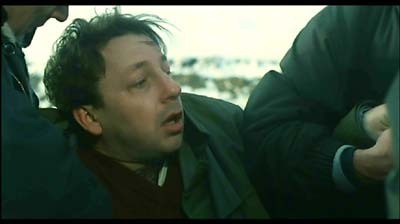 Moments of White are textbook black comedy, including the multiple scenes of Karol being beaten up, and in the tradition of modern comedies it finishes with some form of happy ending. Sticking with that ending, we come to the role of women in this story. Aside from the fact that Julie Delpy has less of a screen presence than Juliette Binoche or Irene Jacob (who wouldn't? ), her role in the story is very limited and constrained. While Karol is portrayed as a man who earns his wealth and succeeds despite his weaknesses, she is presented as spoilt, self-interested, and driven to a large extent by a need for sexual gratification. She divorces Karol on the grounds that their marriage has not been consummated, and only seriously considers taking him back after they have slept together. Rumour has it that the ending was reshot by Kieslowski to make her character seem more sympathetic -- a decision which suggests a current of misogyny running right through this 'comedy'. Much of White is mean-spirited in a way you don’t expect from such an intimate filmmaker. For every moment of innocent joy for Karol, such as him playing his improvised mouth organ in the underground, there is another moment in which he temporarily becomes a monster. After he has been kicked out of his house, he watches an old woman try and fail to push a bottle into a bottle bank. Rather than get up and help her, he sits there smirking in the knowledge that there is someone worse off than himself. And that’s saying nothing of the murky dealings by which Karol comes by a body with which to fake his own death. On top of all this, the film is pulling in several directions with regard to its storyline. Although it is narratively more straightforward than the otherfilms, the central story of Karol trying to get back with his wife is often brushed into the background by the other stories going on around him. Some of these are worthwhile and important: the comic confusion of Karol arriving by suitcase in Warsaw is married to the harrowing scene where he has to shoot Mikolaj, in what is probably the most powerful scene in the film. 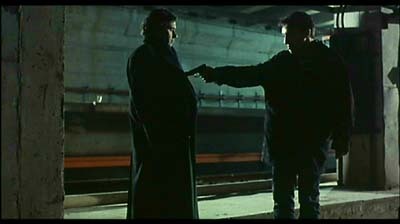 But in all the scenes involving Karol’s business, Kieslowski struggles to discern whether his actions aim for redemption or revenge, and the theme of equality gets lost. Three Colours – White is a good example of a film which has bitten off more than it can chew. It manages to stay restrained and dignified in its treatment of its themes, and the central performance of Zbigniew Zamachowski is generally convincing. But it ends up chasing a series of tails/ tales, never knowing which one to follow and to what end. As a visual exercise it is to be admired, and even Kieslowski’s weakest attempts at comedy are preferable to the rom-com dross of Hollywood. But it is the weakest of the Three Colours trilogy and will frustrate both ardent fans and casual viewers.